Some businesses in Derby have said they are angry at plans to tax them to help fund the city's bid to host games during the 2018 World Cup. 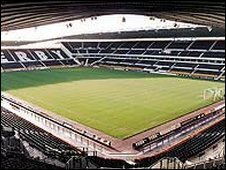 The city council has approved proposals to help fund a £26m extension to Pride Park for the event. Derby's Federation of Small Businesses said some firms would not want to contribute as they feel they will not benefit from the tournament. Derby wants to be one of 12 host cities if England is chosen to host the event. 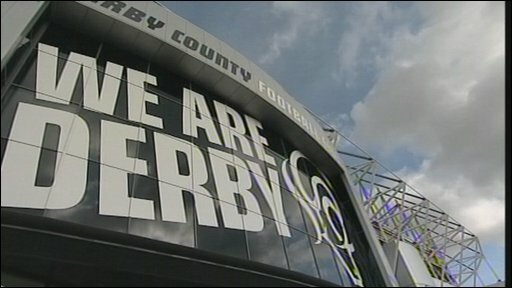 The council has said the World Cup is a "huge opportunity" which would bring great "economic benefits" to Derby. Adam Wilkinson, the city council's chief executive, said: "I think we've got a real hope and potential to actually be chosen. "For a city to be able to demonstrate in terms of marketing and brand that we are going to be a host city is a fantastic indicator and gives a level of confidence to attract inward investment." The authority is looking at proposals to charge firms an extra levy to help fund the stadium's extension. Pride Park's capacity needs to increase from 33,500 to 45,000 to meet FA criteria. Part of the extension would be taken down after the tournament leaving the ground with 35,000 to 38,000 seats. Carolyn Spencer, from the Derby Federation of Small Businesses, said: "Hairdressers won't benefit, ladies clothes shops, greetings cards shops are not going to benefit. "So why should they pay an extra supplementary business rate on top of everything else that they pay to something that is going to give them nothing back whatsoever?" A decision on which country will host the event will be made in December 2010.